Now in its eleventh year, City of Craft is Toronto's largest independently-run, juried craft fair. Beyond featuring the unique handmade wares of more than 60 cutting edge craftspeople, City of Craft engages attendees in a celebration of Toronto's diverse craft culture through craft-based installations, free workshops, and craft-related programming. City of Craft is a place to buy, experience, share and re-imagine all things handmade. City of Craft is a collective of craft-engaged artists and organizers who aim to build community in the Toronto craftscape, support independent craftspeople and businesses, and encourage the larger community to get involved with crafty happenings in the city. We value the integration of craft, community and commerce and strive to communicate the cultural and economic merits of craft: members of the City of Craft community are given an opportunity to realize their potential as artists and entrepreneurs, and the public’s access to craft is increased through opportunities to purchase handmade work directly from the maker, and acquire new skills under the guidance of our workshop leaders. It is our mission to transform the traditional craft fair into a truly cultural event, creating an appreciation for contemporary craft that goes beyond the purely transactional interactions offered by prevailing craft fair culture, and to create accessible art experiences that engage people in their own community. Our audience is composed of mostly young (20-40 year old) urbanites who are interested in supporting local artists and businesses. They include creative industry workers and arts students. Our audience also includes small business owners, buyers and curators scouting new talent for their retail shops, galleries or commissions. Because the festival takes place in the second weekend of December, we attract thousands of people looking for unique gifts for the holidays. Local neighbouring businesses along Queen Street West have reported increased sales and traffic during the weekend of the festival. We currently attract over 4,000 attendees each year. City of Craft is eagerly anticipated by the media and receives press coverage from a growing number of supporters and outlets each year, including the The Toronto Star, BlogTO, Metro, The Torontoist, NOW Magazine, CBC's Metro Morning, Re:Porter (Porter Airlines in-flight magazine) as well as full features in the Globe and Mail and Chatelaine Magazine. Exposure for the festival, our artists, partners and sponsors currently reaches over 20,000 audience members through mailing lists, Facebook membership, and Twitter and Instagram followers. This is in addition to the combined, extensive social media reach of each of our individual collective members and collaborators, which include up to 70 artists and vendors who actively promote the festival, workshop leaders, installation artists, and dozens of community partners and sponsors. Your in-kind sponsorship allows us to keep City of Craft running smoothly in numerous ways. Donations of services and goods, coupons and gift-certificates that could be included in our highly coveted swag bag giveaway, or as gifts for our tireless squad of staff and volunteers go a long way in helping us put on a great show year after year, and in giving you and your company access to our large, loyal audience and community of craft loving citizens! Screen-printed tote bags are given to the first 100 visitors through the door on Saturday morning. These Swag Bags have become the signature icon of City of Craft (prompting several other craft fairs to offer similar giveaways to match our popularity!) 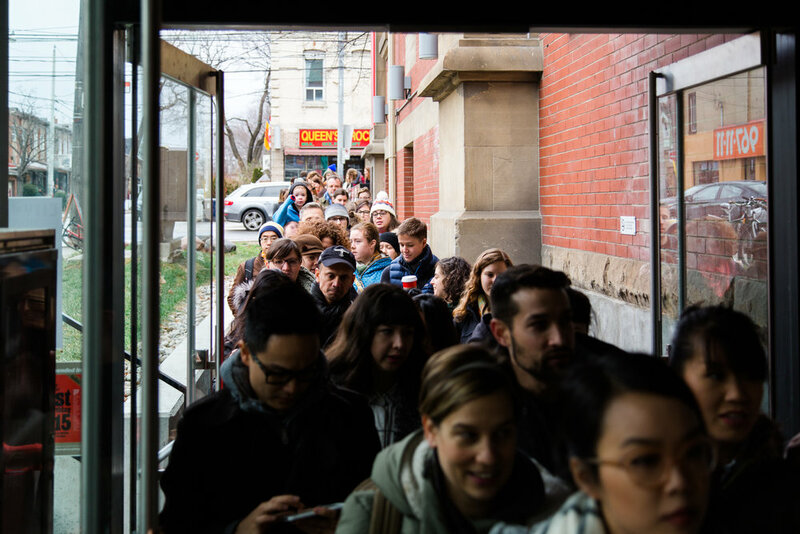 People line up for hours, even through snow storms, to be among the lucky 100 visitors to take home a beautiful hand-printed, made-in-Canada tote (designed by Ness Lee) stuffed with goods, coupons, and gift certificates from sponsors who share our love of craft and creativity. For the first time ever, we are putting together a beautiful package of coupons featuring discounts and deals on crafty services and goods at local, independent boutiques, retailers and businesses. The best part is that we'll create the coupon for you - Artist Shannon Gerard will be designing and printing 200 of these booklets to be distributed in our tote bag give away, and given to our 2017 vendors. Simply provide us with the discount you would like to offer, as well as any additional conditions (we encourage you to include a minimum purchase amount, and a time-frame for redemption). Please note that your Sponsorship level is calculated at retail value and that we cannot calculate coupons that offer a percentage discount, only those that offer a dollar value. A coupon for as little as $3 off goods and services will put you at the highest level of Sponsorship (MAYOR of Craft!) and drive customers to your business during the slower, post-holiday season! Please note that you are welcome to contribute goods in any quantity at all (though we would appreciate multiples of 10 for smaller items), and you can also target them to whichever of these uses you like. Want your goods in 20 of our Swag Bags? Great! Want your goods in all 100 Swag Bags? Perfect! Want to help us reward our volunteers? Amazing! Just let us know. We are also more than willing to work with you to build a sponsorship package that combines any of these elements and works best for you. In addition to the benefits listed below, donations of supplies and materials (for installations and Craft Labs) valued at the COUNCILOR level or higher ($450+) automatically makes you the official Presenter of the activity being sponsored! Your monetary sponsorship will allow us to increase our programming, pay our talented and hard-working installation artists and workshop instructors, all while keeping everything free and accessible for our community members and visitors. Show your support for independent artists and your dedication to the Toronto craft community by sponsoring our installations and Craft Labs. Please note that in addition to the benefits listed below, companies and individuals sponsoring our installations and Craft Labs at the COUNCILOR level or higher ($450+) will be named the official Presenter of the activity being sponsored: The installation or Craft Lab you sponsor will be titled and promoted as being Presented by: your name/business/organization. This information will appear on our website, social media, and all electronic and printed promotional material specific to the installations and Craft Labs (postcards and invites, schedules and program). This year we are creating a comprehensive CRAFT MAP to Toronto - a beautifully designed guide highlighting all the best crafty businesses, services, shops and destinations throughout the city. This full-colour, printed map will be included in our tote bag giveaway, given to our participating artists and vendors, as well as to 4,000 festival-goers. By becoming a MAYOR of Craft, you will automatically be included on this map, thereby becoming a valuable and proud member of our large and rapidly growing community of artists, makers, and DIY enthusiasts! Please note that in order to meet our print deadlines, we need confirmation of participation by November 3rd, 2017, to include your name on our posters and postcards, produce your coupons, and include you in the Craft Map. You can definitely become a sponsor after the November 3rd deadline and still benefit from other rewards. Delivery or pick-up of your donation can happen any time until December 4th, and can be arranged directly with our coordinators.